I have been zero waste for almost three years now. I have picked up so much information along the way and found the best tools for me. Every zero waster is going to have different things that that make their lives easier. It will take time to figure out what those things are for you. I have saved SO much money since going zero waste, which has allowed me the opportunity to experiment with different items. Prefer video content? Scroll all the way down to the bottom of the page! I also write a popular blog, which has given me a platform to test new items. This means companies send items to me for free in hopes that I will write about them. Very few make it to the blog, but I just want to make sure you know that it is a privilege I have now. When I first started going zero waste in 2015, I was completely broke. I didn't have a blogging platform. I didn't have really any disposable income, but going zero waste was important to me. I decided that all I could invest in going zero waste was $50. I'm going to tell you what I bought, and how I would have handled it hindsight. Of course, I still realize having a spare $50 is not a luxury everyone has. But, I do hope this helps people who are looking to go zero waste on a budget! It doesn't have to be a super expensive endeavor. You don't have to have fancy metal lunch boxes or shop at specialty zero waste stores. I went to the thrift store to buy pillow cases to stitch into produce bags. I picked up two large pillow cases for $2. I figured pillow cases would be a good place to start since they would have a couple of sides finished for me. I cut my pillow cases into six bags, and hand stitched the edges. I do not have a sewing machine, but I am pretty handy with a needle. I only bag produce that is small and needs to stay together like lettuce or mushrooms. This prevented me from needing lots of bags. It was rather limiting when going to the bulk store, but I did have a hefty selection of mason jars. I'm very proud of my hand stitched produce bags! Also, a photo of my thrift store pillow cases. I was so proud of my purchases. I feel very fortunate that my thrift store had mason jars for cheap! I could get a mason jar with the lid for around 50 cents. I also bought grocery items in glass jars with the intention of reusing the jars. $15 worth of mason jars plus the ones from pasta sauce and salad dressing gave me a pretty large collection of around 50 jars. I also had three roommates, and I collected all of their jars too. This photo is of my very first run to the thrift store after deciding to go zero waste resulted in these four mason jars. Back then my thrift shop wrote on the glass jars with a wax pen. It kept the whole experience waste free. I also picked up a couple yards of some nice scrap fabric at my local thrift store. I hand stitched dinner napkins for myself and Justin. I figured it was the cheapest way to get cute napkins. I was also very into stitching at the time. I embroidered a cobra on the back of Justin's denim vest for Valentine's Day. It was a nice little hobby for me. Recognize these napkins? They have certainly shown up in a fair amount of my posts. Also, can we just admit how much better my photography skills have gotten? This was definitely a HUGE splurge item for me. I was also terrified of buying a menstrual cup. I had never liked wearing tampons, so making this switch was a little scary. Also, a HUGE investment for me at the time. I wound up going with the Blossom Cup* because it has a love it or your money back guarantee. I knew if I didn't like it, I could always send it back. I wound up loving it, and it's one of the best purchases I've made. I found my very first klean kanteen at the thrift store for $1! I was so incredibly thrilled. It was not an insulated klean kanteen, but I also found a stainless steel thermos for hot drinks. Justin and I both like iced coffee so we traded off on who got hot coffee with our one thermos and who got iced coffee in the mason jar. 9 times out of 10, I got the iced coffee in the mason jar because it was just a little too "hipster" for him. This was the run to the thrift store where I found my first klean kanteen! You can see from the receipt for three mason jars and the water bottle I paid $2.31. I have to say, I thought these bags* looked amazing. Look at the pockets! I could keep my mason jars from banging together when going to the grocery store! But, those bags are complete and utter failures. By far, my most disappointing purchase I have made since going zero waste. The pockets are sewn to high up on the bag. The pockets don't have any bottoms. They're open top and bottom, and any thing you put in them just falls out through the bottom of the pocket. Unless it's a baguette. The only thing tall enough to actually utilize the pocket is a baguette. I still have the bags and use them, but they're not my favorite. I honestly can't believe how many photos I have documenting my first zero waste purchases. This was before I had an instagram account or a blog. It's nice to be reminded how enthusiastic and excited I was. Not that I'm not excited now, but zero waste has become routine for me. Back then, it was all so new and thrilling! It was exciting, and every day was like a game. I woke up with a, "How can I avoid trash today?" mentality. 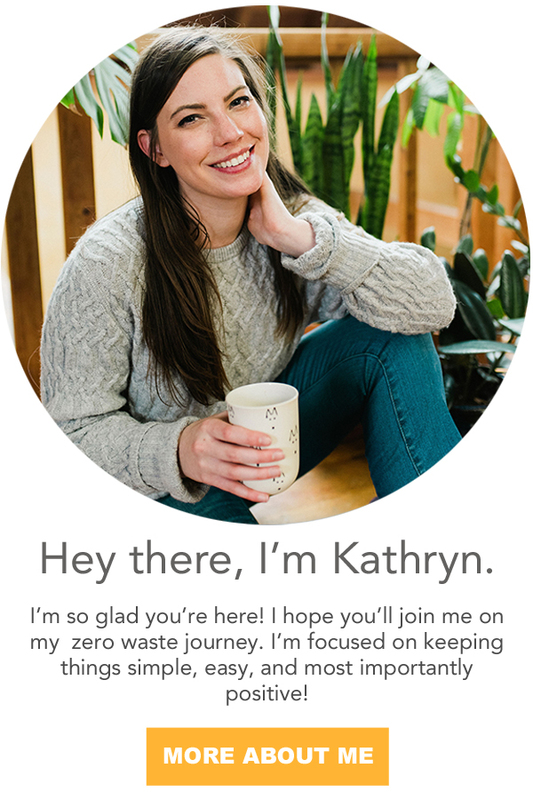 Did you have a large start-up cost when you went zero waste? Were you budget savvy? How did you get started?